Story Contracting’s works to replace Bell Bridge at Sebergham, on behalf of Cumbria County Council, will commence on Monday 17 July. 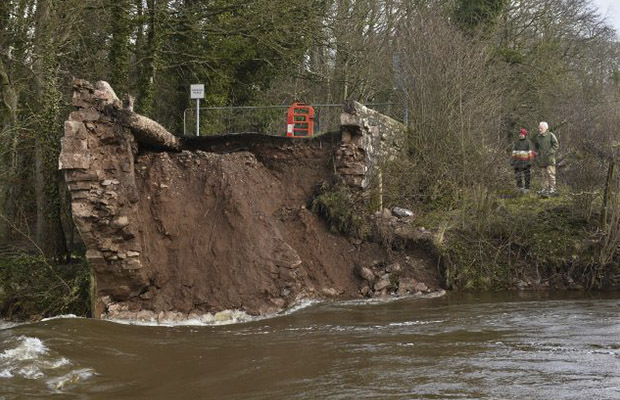 The bridge was completely destroyed following Storm Desmond. The reconstruction of Bell Bridge will allow the council to restore the road over the River Caldew to reconnect communities separated by the flood. The council appointed Story Contracting to design and construct the works, with an intended completion date of November 2017. Works were planned to start in June, but were delayed due to the requirement for Electricity North West to divert overhead cables to make the site safe for vehicles and workers. Previously, Bell Bridge was a single-span hump-back arch, under a solid parapet with chamfered coping. This was constructed in 1772 and replaced the original Bell Bridge which was destroyed by a flood in 1771. The bridge was named after the Bell Family of the nearby Bell-bridge Farm. The new bridge will be formed in weathered steel beams with masonry-clad reinforced concrete abutments and parapet walls, making the new bridge look as similar as possible to the original but ensuring resilience to any future flood events. It is intended that as much of the original stone as possible will be used to face the new bridge.